Dysrhythmia have post another new song from Test of Submission. 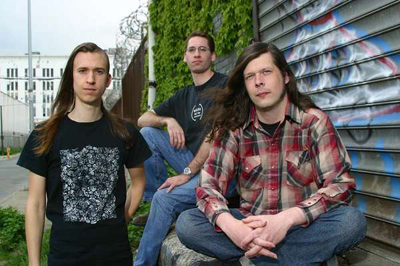 ‘In Secrecy’, which NPR are streaming HERE, is the band’s usual brand of chaotic tech metal. The creative trio of Kevin Hufnagel, Colin Marston and Jeff Eber never produce a dull moment, there’s always something unexpected around the corner, whether it’s the deafening rumbling crunch of the bass or the noisy, erratic riffs that come from all directions. The new album Test of Submission is out later this month.